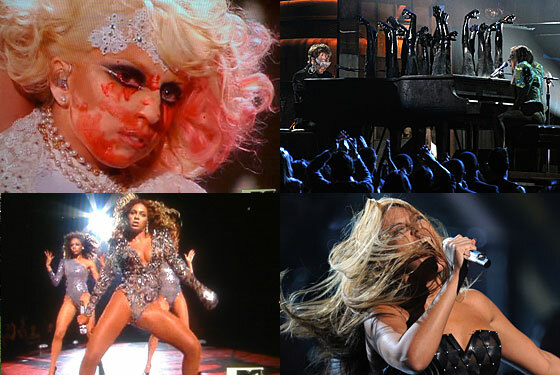 If You Missed the VMAs, You Probably Loved the Grammys! Wow, the Grammys sure were a spectacle last night, eh? After all, where else are people whose television sets still require rabbit ears going to see the likes of Beyoncé, Lady Gaga, Green Day, P!nk, and Taylor Swift perform on the same stage on the same night? Sadly for the Grammys and those of us who have purchased television sets sometime in the last 30 years, the music industry’s biggest showcase was pretty much a repeat of what we saw back in September at the MTV Video Music Awards, only far more boring. Let’s compare and contrast the performances from both nights, shall we? Back in September, Lady Gaga’s popularity had yet to crest. Sure, “Poker Face” and “Paparazzi” had been huge chart hits, but “Bad Romance” was but a twinkle in her eye. And since it was Stefani Germanotta’s big coming out party and first major televised performance here in the States, she made sure to pull out all the stops for the VMAs: Not only did she go through so many costume changes that we lost count, she also turned in a memorable (and blood-soaked) performance of “Paparazzi.” Her duet with Elton John at the Grammys last night was okay, we suppose, but it didn’t have nearly the same fire or sense of urgency as when Elton did the same thing with Eminem way back in 2001. Even when Beyoncé performed a medley of songs from her (mostly bland) I Am … Sasha Fierce LP at the VMAs, we couldn’t help but feel like there was something about it that felt a bit stale. After all, her record came out in early November of 2008, so we had been living with the songs in our iPods and on the radio for nearly a year. Still, we came away from her VMA performance feeling impressed by B’s boundless spirit (if a bit shocked because we got the kind of view of her fallopian tubes that only her gyno and Jay-Z normally get to see). Whereas last night, she rolled out a performance of “You Oughta Know” that she’s been doing every night in concert for the last year. If it weren’t for Kanye West’s shenanigans that night, it’s quite possible that we wouldn’t be living in a world where we are besieged by Swifty everywhere we turn. Despite our growing disdain for the country star, even her greatest critics will admit that her performance of “You Belong With Me” in a subway and on top of a taxi cab in front of Radio City Music Hall was triumphantly joyous. And frankly, the less we say about her tuneless and pitchy attempts at singing “Today Was a Fairy Tale,” “Rhiannon,” and “You Belong With Me” last night, the better. Someone get this girl her own Cirque du Soleil show, stat! Back in September, we were awed by Alecia Moore’s ability to spin hundreds dozens of feet above the stage at Radio City Music while also singing “Sober.” She basically did the exact same routine last night, only this time, she made the curious decision to urinate on the crowd below while doing so. We can’t be the only ones who have grown really tired of Green Day’s self-important streak, can we? Their performance of “21 Guns” at the VMAs back in September put us to sleep, but it was infinitely better than the overwrought and depressingly mediocre Broadwayified version of the song they did last night. And now, after seeing a hint of what the American Idiot musical is going to look and sound like, we think we’ll just hold out for someone to adapt Rancid’s … And Out Come the Wolves instead.